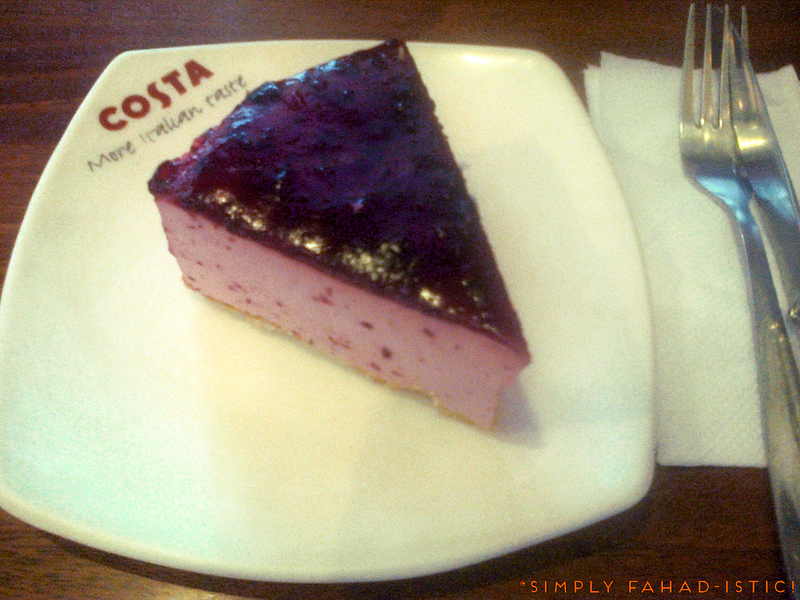 One Dish At A Time: Raspberry Mousse Cake at 'Costa Coffee',Delhi - Simply Fahad-istic! Costa Coffee serves some delectable desserts! I still remember their Chocolate Mousse & Banana Cake that I relished during the Xmas season - Smooth, luscious and creamy chocolate mousse layered with flavourful banana cake and topped with a generous piping of decadent ganache. I had picked it up as a takeaway, and microwaved it for a few seconds before eating, upon reaching home. An absolute treat! 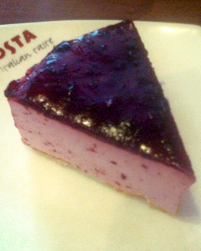 So hopes were high as I ordered this Raspberry Mousse Cake, unknowing that it would leave me rather disappointed. Priced at Rs. 105,for one I want to know,why is it called cake at all?Apart from that poppadom-thin layer of sponge at the bottom(Everyone,grab your magnifying glasses!) ,there was no cake to be seen. 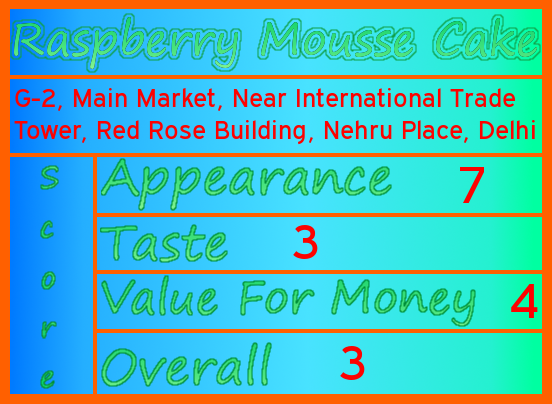 Secondly,the mousse was too gelatinized(Firm and dense) ,not at all creamy like how it should be. More Italian taste?I think not! All One Dish At A Time reviews on Simply Fahad-istic! 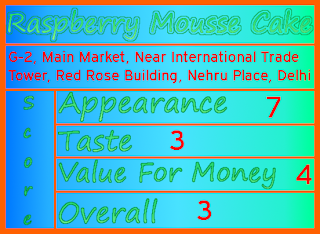 express only the blog author's opinions and are strictly for educational purposes only.They are not to be considered endorsements or warnings for/against purchasing these dishes/preparations from the mentioned properties/entities.Since there have been no discussions with the owners of these properties/entities,no kitchen or back of the house visits,assumptions have been made about some situations pertaining to operating procedures and may not necessarily be true.Menu prices mentioned are of the time of the reviews and are subject to change.These reviews are not paid for by the property/entity owners and are a result of anonymous visit(s).